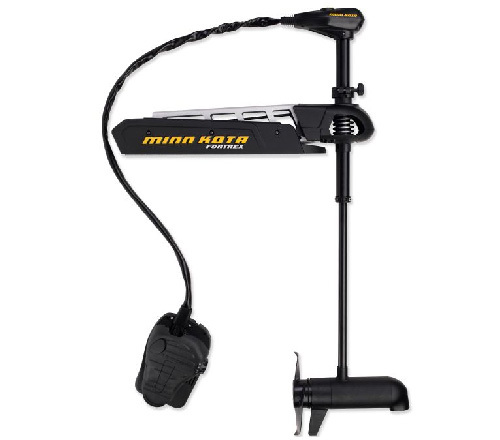 The Minn Kota Fortrex 80 is a freshwater bow-mount trolling motor with a 52 in. shaft. (45" also available). It is designed with the power to tame rough water, push through heavy vegetation and take the kind of pounding that day after day of hard fishing delivers. The Weedless Wedge™ 2 prop features swept-back and flared blades to "wedge" weeds away and pass through the thick stuff without battery-draining "chopping and hacking". This motor is equipped with illuminated directional indicator that ensures perfect directional heading. The Fortrex 80 features Bowguard 360°™ breakaway mount that breaks away on impact from any direction, protecting your motor, shaft and boat. Its counter-tension stabilizer uses an integrated spring that applies force whether the motor is stowed or deployed.